One of my fondest memories as a kid was riding my bike to our local Radio Shack to see what was new. What items, just in, might ultimately make my birthday list or Christmas list. As I grew older, Radio Shack or RS became the go-to place for kits, electrical components and a dose of education the sales personnel were always willing to impart. RS provided me with my first do-it-yourself kit AND their personnel gave me schooling on how to properly solder components into a “bread-board”. RS has come under fire recently and is in a struggle to remain a viable retail outlet. They are laying off workers and closing stores in an attempt to avoid bankruptcy. The company is trying to save $400 million with the electronics retailer is reeling from a $161 million loss during the three-month period that ended November 1. The 93-year-old, 4,000-store company closed 175 stores this year (2014) and is planning to close an additional 1,000 stores. We may be seeing the dying gasps of a company that once meant quite a bit to those interested in home electronics. RadioShack could follow in the footsteps of many other huge retailers that have declared bankruptcy in the past decade: Circuit City, Blockbusters, Borders, and Linens ‘n’ Things, to name a few. In each of these cases, there were mass layoffs and store closures that affected tens of thousands of workers and their families. RadioShack traces its roots to two separate and very different entrepreneurial ventures: The Hinckley-Tandy Leather Company, a supplier of leather shoe parts to shoe repair shops founded in Fort Worth, Texas, in 1919; and RadioShack, a retail store and mail-order operation that was established in Boston in 1921 to serve the needs of radio officers aboard ships. RadioShack quickly grew to encompass a handful of stores in the Northeast, as well as a successful electronics mail-order business. The Hinckley-Tandy Leather Company also prospered, and in 1954, it sold its flagship leather business to expand its scope of operations. In 1959, the company shortened its name to Tandy Corporation, and in 1963, Tandy Corporation acquired RadioShack, marking the company’s start as a personal electronics retailer. In 2000, Tandy Corporation changed its name to RadioShack Corp., listing on the NYSE under ticker symbol RSH. After beginning with one Texas store, the Radio Shack portion of the company branched out into the electronic catalog business. 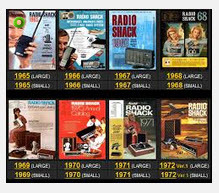 The first Radio Shack catalog came out in the early 1940s. The company entered the growing high-fidelity market in 1947, opening the nation’s first audio showroom where people could compare amps, speakers, and turntables. 1919: Two friends start the Hinckley-Tandy Leather Company in Fort Worth, Texas, supplying leather shoe parts and supplies to repair shops. 1921: Two brothers open the first “Radio Shack” in Boston, a small retail and mail-order business supplying ship radio equipment and “ham” radios. They borrowed the name for the store from the small wooden structure onboard ships that housed the radio equipment. 1935: A predecessor of present-day RadioShack Corp. lists shares for trading on the NYSE. 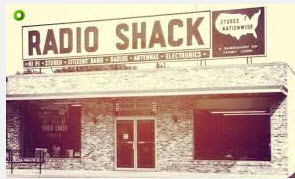 1947: Radio Shack opens the first audio showroom to feature speakers, amplifiers, turntables and phonograph cartridges. Also that year, Charles D. Tandy joins the family business and would soon begin to chart a new direction for the company’s expansion. 1954: Radio Shack sells its leather operations to a New England firm and embarks on a capitalization plan to finance future expansion. 1959: Charles Tandy is elected as chairman of the board. The company is renamed Tandy Corp. and officially moves the headquarters to Fort Worth. 1959: Tandy Corp. sells its first Realistic CB radio. 1963: Tandy acquires Boston-based “Radio Shack” (as the retailer was then styled). 1972: The Company sells its first all-electronic calculator. 1978: Charles D. Tandy dies. Later, the Fort Worth community erects a statue memorializing his visionary entrepreneurialism near the company’s headquarters downtown. In 2009, the statue was relocated to Tandy Hall at Texas Christian University’s Neeley School of Business. 1983: The Company introduces the “Model 100” laptop, the first of its kind in the computer industry. 1984: Radio Shack sells its first mobile phone. 1985: The Company starts selling satellite television systems and service. 1994: RadioShack begins offering free rechargeable battery recycling, responsibly disposing of more than 7 million pounds of rechargeable batteries to date. 2004: RadioShack launches kiosk sales segment in partnership with national wireless carrier and big-box retail partner. 2005: RadioShack Corp. moves headquarters to new Riverfront Campus along Trinity River in downtown Fort Worth. 2005: RadioShack becomes an Authorized Apple Reseller and later introduces Skype-certified hardware and software in stores for free voice- and video-calling over the Web. 2008: RadioShack launches Trade & Save, a trade-in program that allows customers to trade used devices at no cost, no matter where they were purchased, for credit toward a new purchase. RadioShack also acquires full ownership of RadioShack de Mexico. 2009: RadioShack concludes an extensive two-year grass-roots education campaign with the American Library Association to assist consumers in navigating the nationwide conversion to digital television broadcasting in high-definition, which earned a special commendation from the FCC in 2010. 2011: RadioShack introduces Verizon Wireless, the nation’s largest wireless carrier, and its industry-leading products and services in stores nationwide. Along with AT&T and Sprint, consumers can choose from all three top post-paid carriers as well as a range of pre-paid options. 2012: The Company introduces RadioShack No Contract Wireless in recognition of the growing popularity of pre-paid plans. 2013: RadioShack introduce our new brand and opens the doors of our first concept store in Manhattan in July 2013. We later open our first custom concept store paying homage to our hometown and technology heritage in the popular Sundance Square area of downtown Fort Worth. 2013: RadioShack launches the unparalleled “IT Happens” protection plan in November, offering same-day in-store replacement for qualifying products priced less than $300 and many more benefits through a simple in-store claim process. 2013: By the end of 2013, the company will have made improvements to nearly all 4,300 U.S. company-owned stores. This includes more than 100 concept and brand statement stores, which feature bright, completely redesigned interiors and new exterior signage. Today: RadioShack employs more than 27,000 associates and has a vast retail network that includes more than 4,400 company-operated stores across the United States and Mexico and more than 1,200 dealer and other outlets worldwide. With that unparalleled network of expert associates and neighborhood stores, RadioShack is inviting customers to experience the mobile and connected opportunities of their devices, marrying customers’ needs with associates’ knowledge. Let’s take a quick look at several images that will give a better idea as to the store and its early merchandise. The JPEG below is the very first Radio Shack store in Boston. As you can see, humble beginnings. One store with the right idea, at least for the time period. The JPEG below is not that readable but does show the variety of products RS sold throughout their stores. Over time, many additional franchises were added so that today multiple stores occupy locations in the same city. RS was one of the very first to market and sell home computers to the masses. 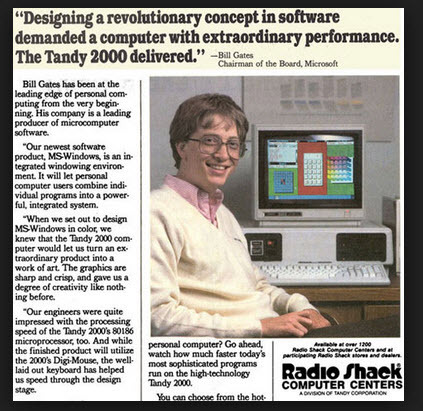 As you can see from the digital below, one very famous individual, Bill Gates, was used in an advertisement for the Tandy 2000, a revolutionary device that promised to greatly lessen the time to process mundane tasks. Another product in the computer line was the TRS-80. It was an instant best seller and was the forerunner to products we take a commonplace today. 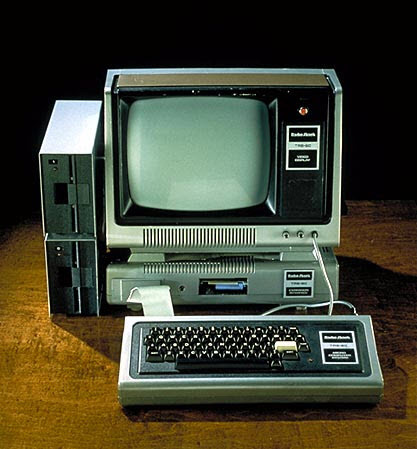 Tandy 2000 and the TRS-80 provided the purchasing public with a glimpse of things to come relative the computing world. I think it is very sad that Radio Shack is having difficulties and they are losing management personnel that could possibly “right the ship”. Retail is an extremely difficult way to make a living today with mail-order taking so much sales in the marketplace. I for one definitely hope RS can make it through these tough times. Hopefully, they will make efforts to place laid off employees in other positions of responsibility. AT&T Stadium. This is where the Dallas Cowboys play. It’s a marvelous structure. 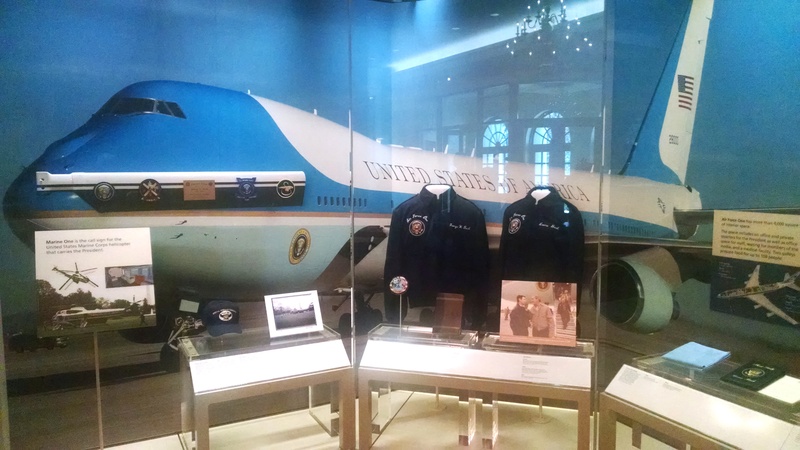 The Library is the repository for textual, audiovisual, and electronic Presidential records created or received throughout the Administration of President George W. Bush as well as other donated collections. 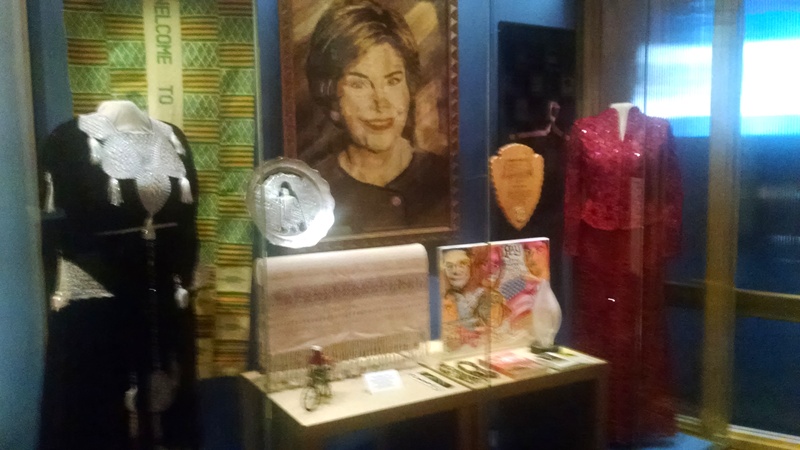 Over 70 million pages of textual Presidential materials are housed at the George W. Bush Presidential Library and Museum. 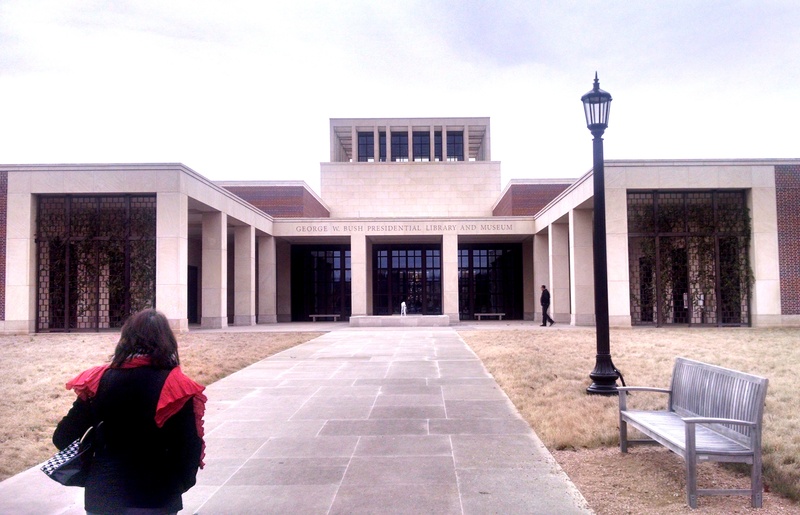 The Bush library, which was dedicated on April 25 and opened to the public on May 1, cost an estimated $250 million to build. According to officials, the money Bush raised went towards the construction and operating costs of the library which is located on the campus of Southern Methodist University. The remainder of the money raised will go to the George W. Bush Institute, a public policy foundation. On September 11, 2001, the United States endured a deadly attack when terrorists hijacked four planes and crashed them. The hijackers intentionally flew the first three planes into important targets: both towers of the World Trade Center in New York City and the Pentagon building in Washington, D.C. The fourth plane, which some speculated was headed for the White House, crashed in Somerset County, Pennsylvania. Passengers aboard the plane, talking on their cell phones, learned what the hijackers intended to do and with astonishing heroism tried to overtake the hijackers, saving the fourth target and sacrificing their lives. Bush authorizes bailout of financial institutions to negate run on banks and bank failures. 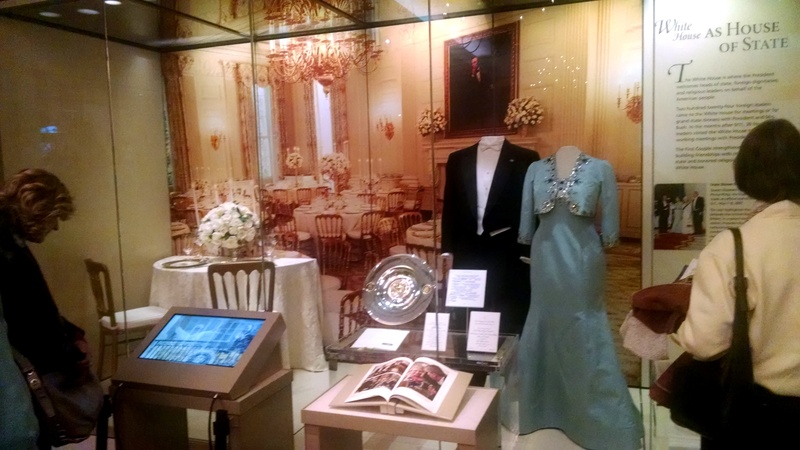 These events and more are detailed and chronicled in the Presidential Library. I would like now to take you on a pictorial tour of the library. ONE NOTE: some of the digital pictures are not exactly professional. I used my cell phone for all of the JPEGs but the lighting inside the library accomplishes an affect that is not conducive to the best photographic quality. The digitals indicate several major areas of interest. 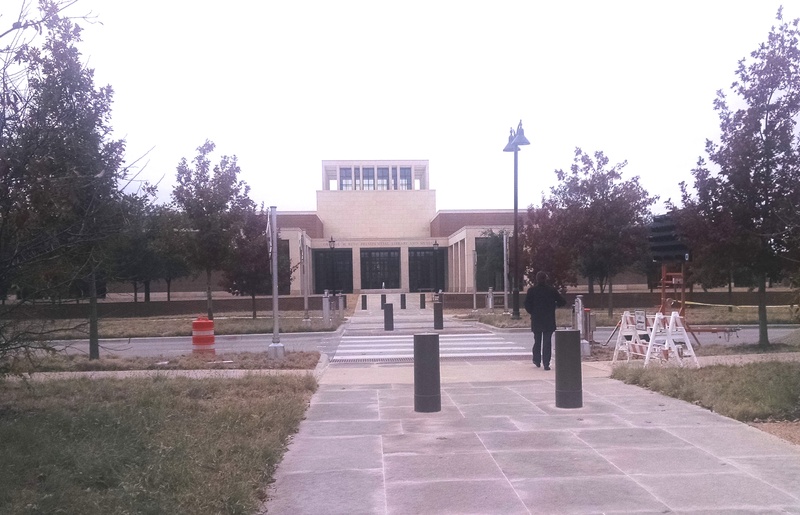 The main entrance to the library is a sweeping path allowing access from the parking facility to the front door. As you can see, it was an overcast day with low-hanging clouds. Not exactly an F-8 day. My wife is wearing a heavy coat and a scarf. It was one of those cold days in Dallas and very cold, I’m told, for that time of year. 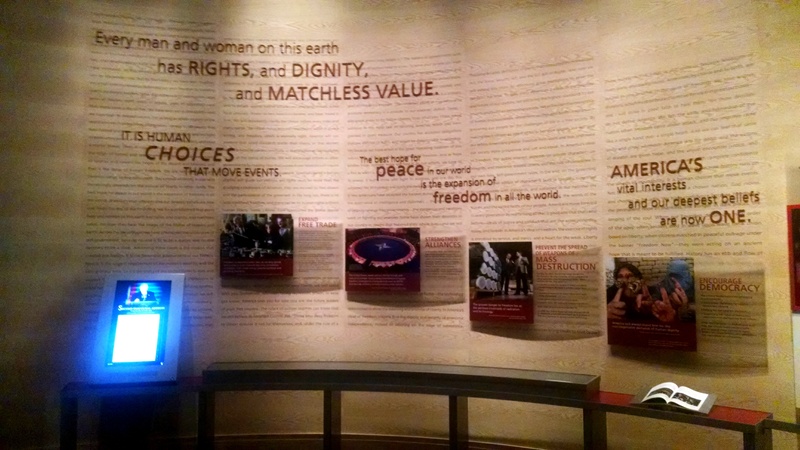 One marvelous feature of the library is the ability of the visitors to interact with computer systems pulling up and displaying facts about the White House and the presidency of George W. Bush. You can see from the slides below consoles available for viewing on a variety of subjects relative to his presidency. 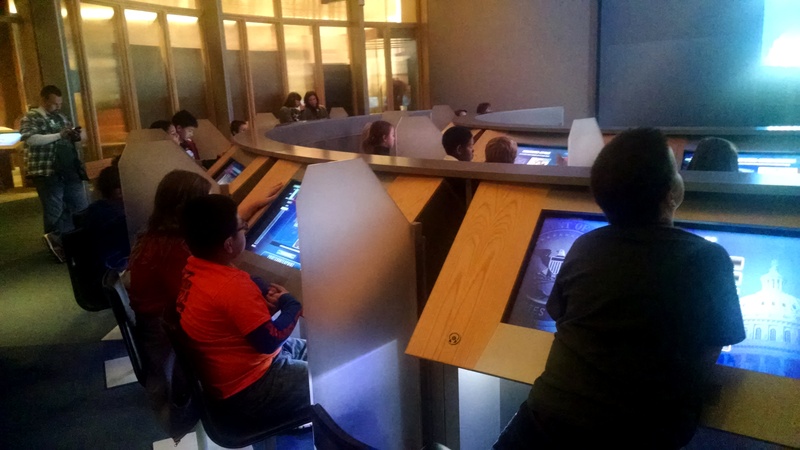 Each console employs touch-screen technology facilitating access to information relative to each educational cell. 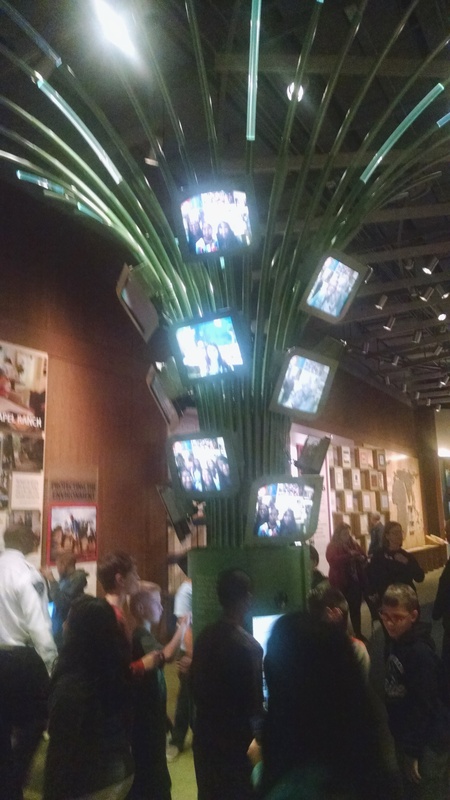 The TV “tree” in the JPEG below will also indicate viewing available in the library. Every president is given gifts from visiting dignitaries. The Bush presidency was certainly no different. All of the gifts belong to the American people; consequently finding their way into the library and the archives. 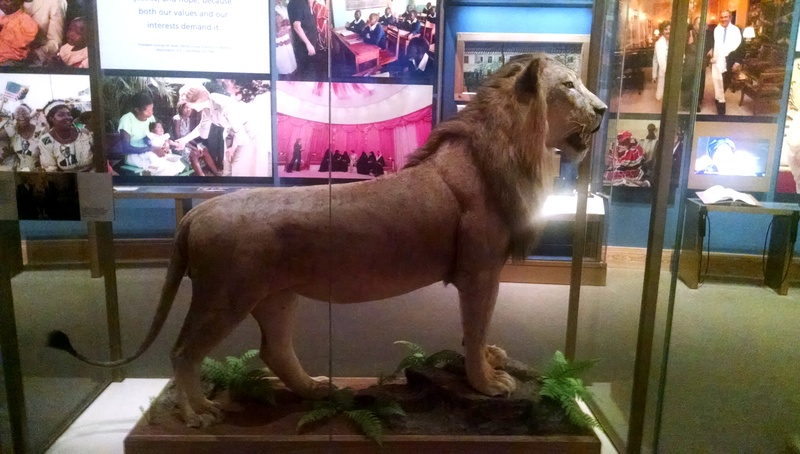 YES—it is a stuffed lion! There are many many others but this is just a flavor of what has been given over the course of eight (8) years. 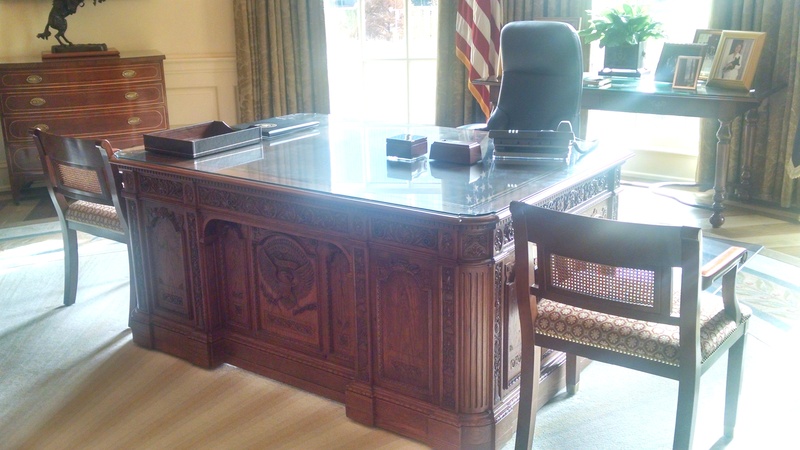 This presidential library has an exact replica of the oval office. I think some, maybe most, do. The following digitals show the Bush office starting off with the presidential seal above the office door. I was amazed at the intricacies of the desk. It is truly a work of art. 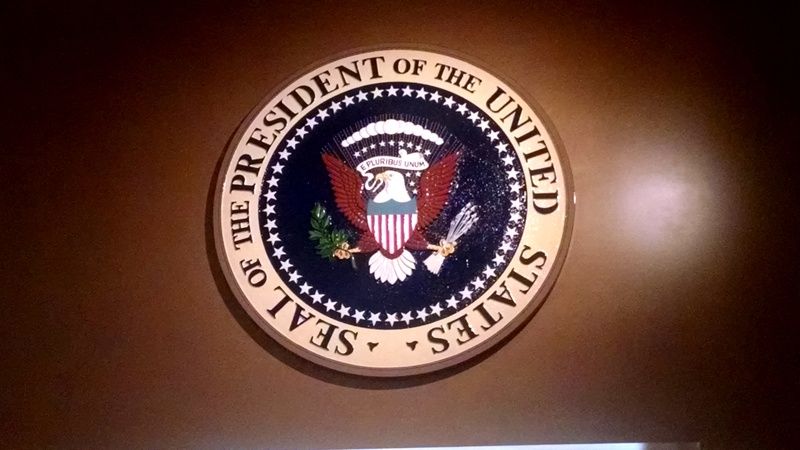 The Presidential Seal is carved into the face of the desk and is an exact duplicate of the seal over the door. 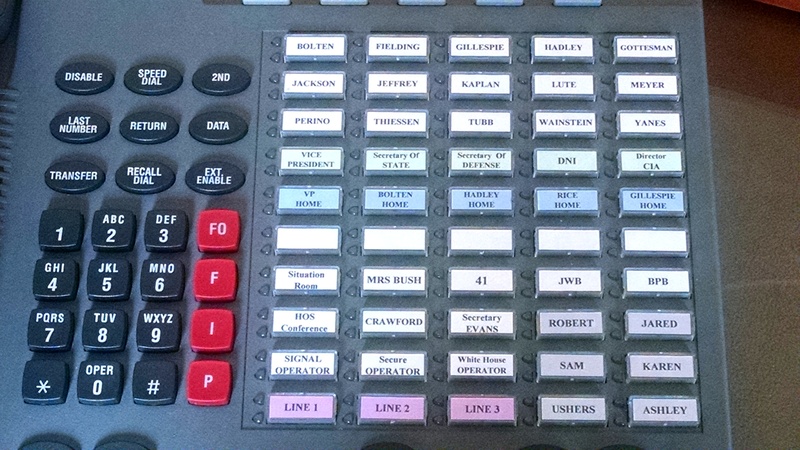 The actual desk phone used by Bush is parked in a prominent location on the President’s desk. Notice the speed dial buttons. That has to tell you something about his inner circle. There is no event in my lifetime as traumatic as 911. I can remember exactly where I was and the circumstances of that day and for weeks following. 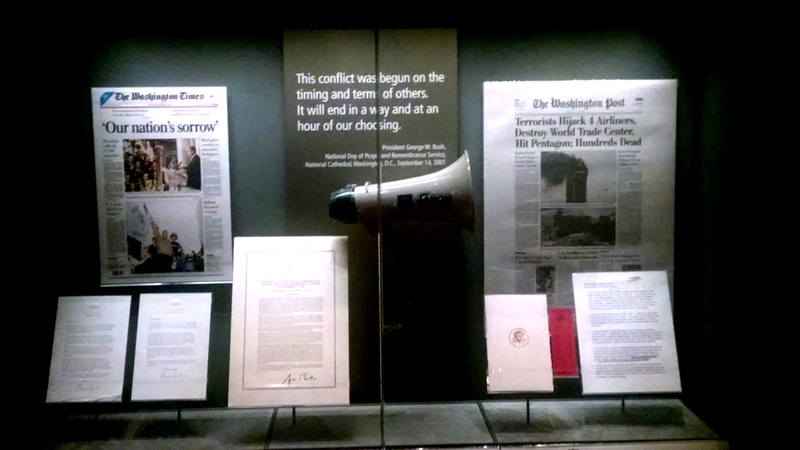 One representation of that event is the bullhorn used by Bush during the time period right after 911. 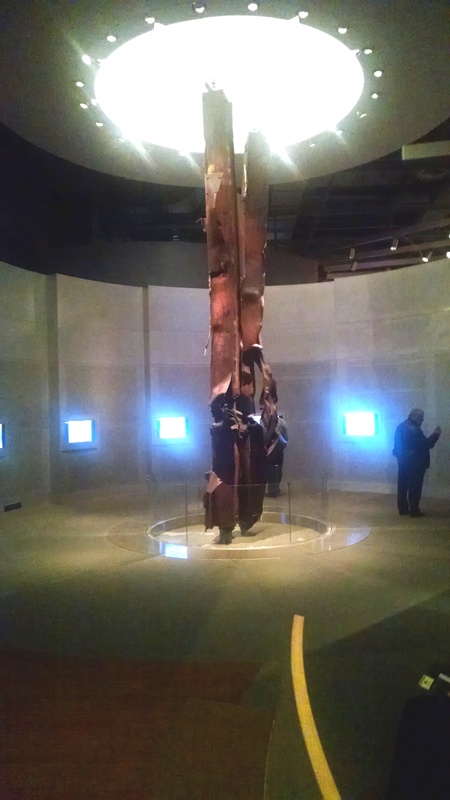 Pieces of twisted metal from the trade centers are on display indicating the massive destruction resulting from the events of that horrible day. 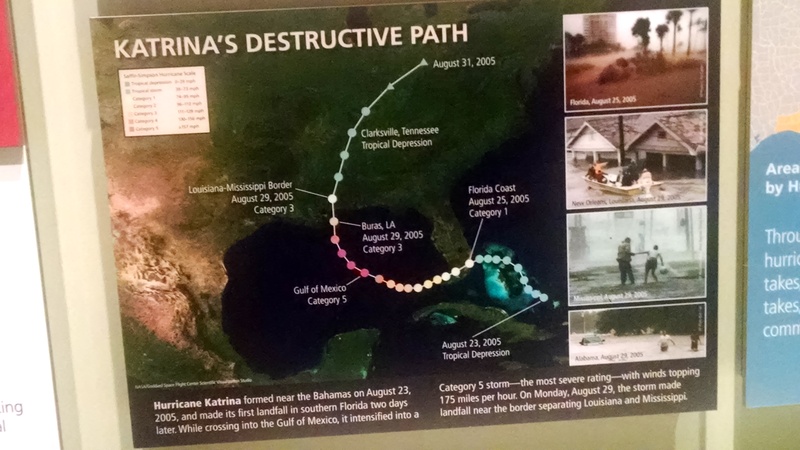 One excellent display detailed the path and destruction of hurricane Katrina. Katrina was an absolute disaster for the people living in New Orleans. 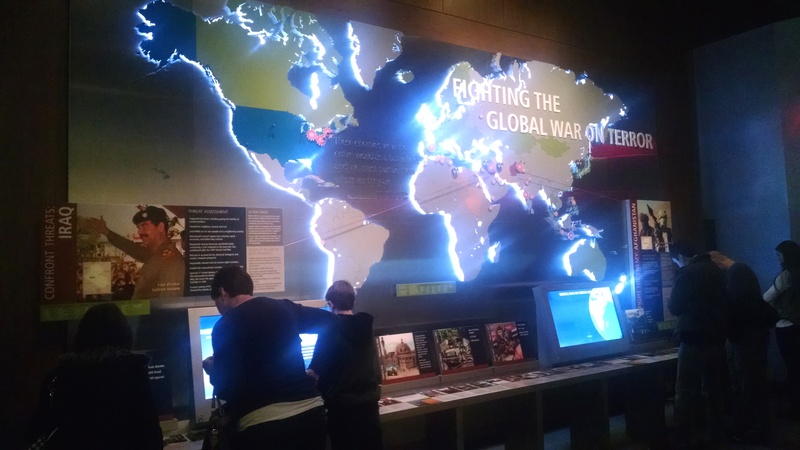 We were able to see first-hand the enormous power of dynamic and sometimes violent earth. There were 1833 fatalities from that storm with insurance companies paying $41.1 billion on 1.7 million claims. Katrina is the most costly disaster in the history of global insurance. The entire occurrence is detailed in the cell presented. All was not gloom during the White House days and 43 was very much aware of how a wealthy country, such as the United States, can contribute to needed corrections in third-world countries. His efforts in aiding African nations was displayed by the following digital. What you can’t see, each “dot” on the maps below show a picture of individuals benefiting from the generosity of the American People. 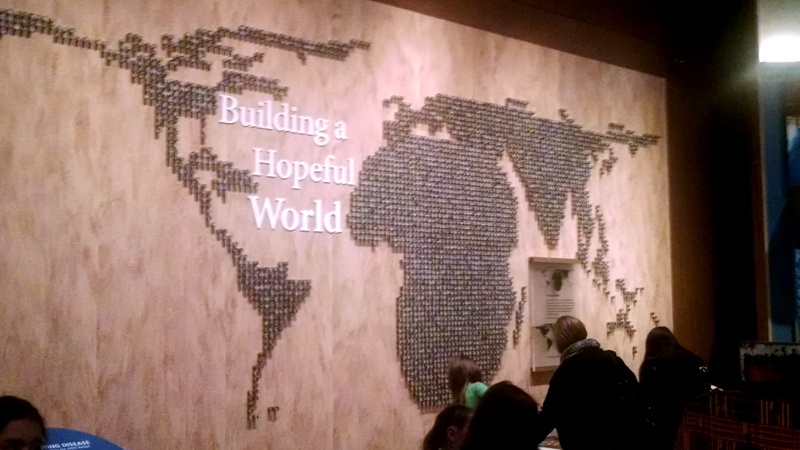 Rights and Dignity was a significant part of “Building a Hopeful World. We are told that Bush could not wait to exit the White House and the only real thing he would miss is Air Force One. It is truly one “mean ride”. Imagine being the President of the United States and what a burden of command that lofty position requires. No wonder presidents age twenty (20) years during their “tour of duty”. Air Force One and Marine One are shown below. 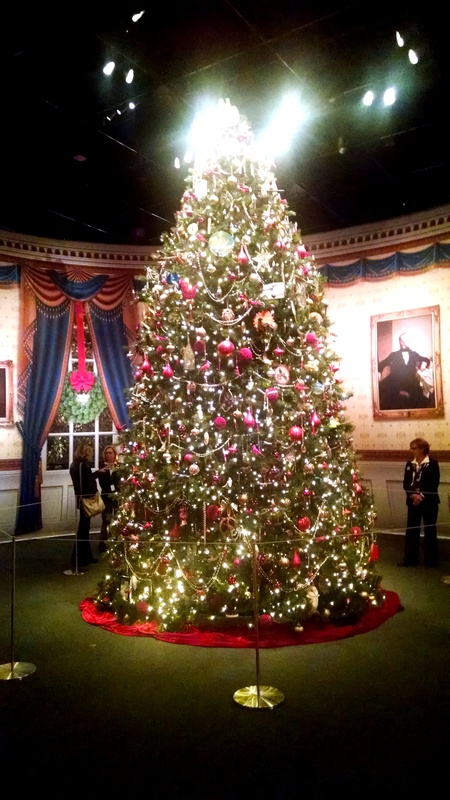 We cannot close without showing the Christmas tree during one Christmas at the White House. 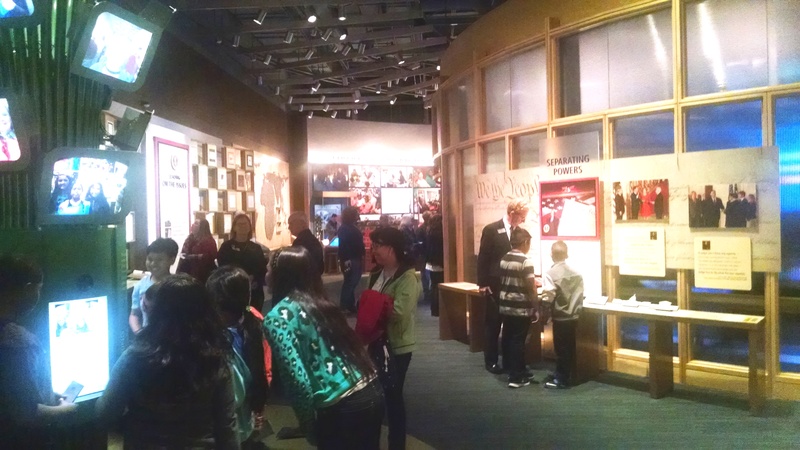 You may be Republican, Democrat, Liberal, Conservative, Independent BUT a visit to one of our marvelous Presidential Libraries is a must. This is the second one we have visited and both have been excellent in the manner information and material is presented. Every school child and student should be required to make a visit to get a brief glimpse of history. I welcome your comments. Hope you enjoyed this one. One of the most enjoyable vacations my family and I have ever had was to Barcelona, Spain, a fabulous European city. I cashed in four “frequent flyer” tickets for that eleven day event suspecting we would have a wonderful time. I was, or we were, not disappointed. 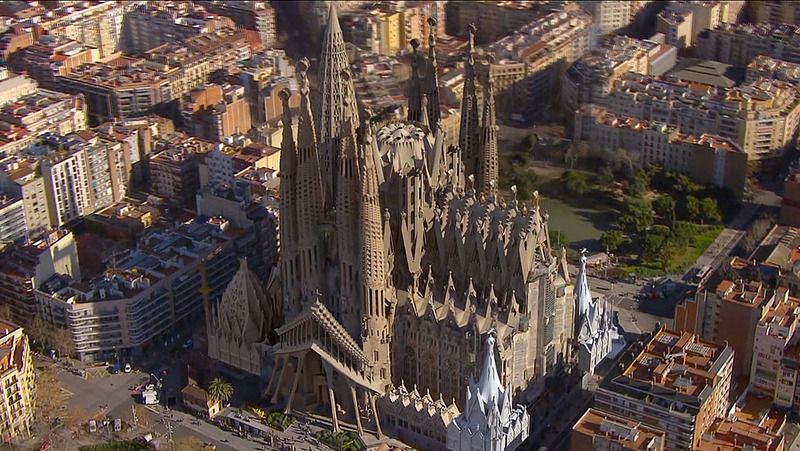 One marvel of the “new world” is Antoni Gaudi’s Sagrada Familia. A magnificent structure and one every engineer should visit. Let’s take a look. 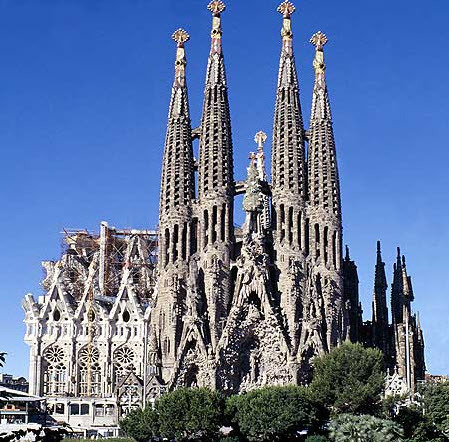 Sagrada Familia (Holy Family or in Catalon: La Sagrada Familia) is located in the Eixample region of Barcelona. 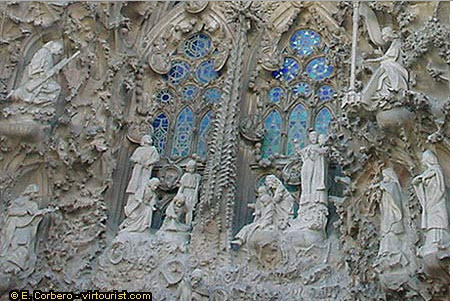 The Sagrada Familia was designed by the architect Antoni Gaudi with construction beginning in 1883. 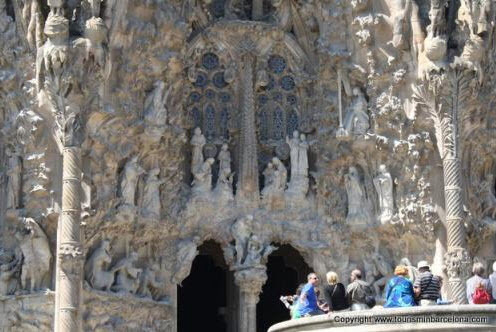 Construction was unfortunately stopped due to Gaudi’s sudden death in 1926 and resumed only in 1946, after many disputes regarding the design and financing. Gaudí is one of the most outstanding figures of Catalan culture and international architecture. He was born in Baix Camp (Reus, Riudoms) on June 25, 1852, but attended school, studied, worked and lived with his family in Barcelona and Barcelona became home to most of his great works. 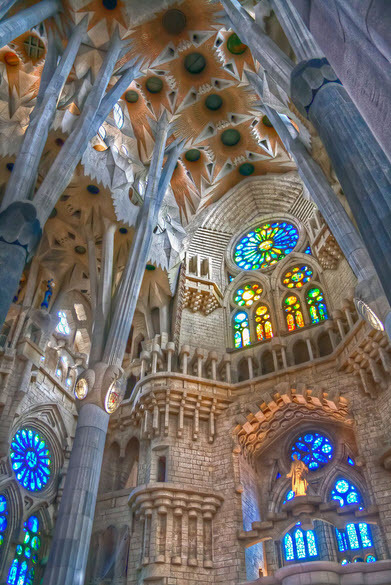 Gaudí was part of the Catalan Modernista movement, eventually transcending it with his nature-based organic style. 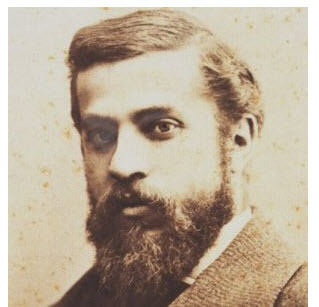 Gaudí died on June 10, 1926, in Barcelona, Spain. He was first and foremost an architect, but also designed furniture and worked in town planning and landscaping, among other disciplines. In all those fields he developed a highly expressive language of his own, thus creating a great body of work. 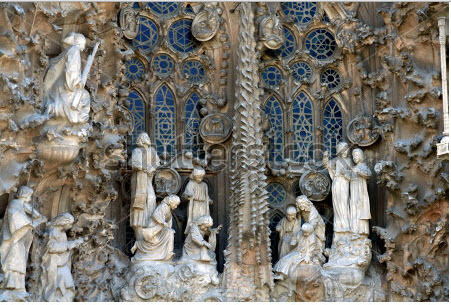 When work began on the Sagrada Familia in 1882, the architects, bricklayers and the laborers worked in a very traditional way. 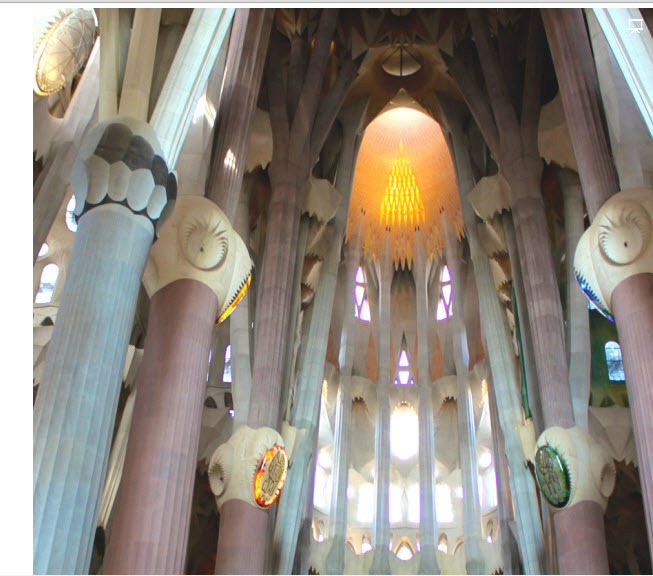 Gaudí took over the direction of that work and knew the tasks were extremely complex and difficult. With that being the case, he tried to take advantage of all the modern techniques available. Among other resources, he had railway tracks laid with small wagons to transport the materials, brought in cranes to lift the weights, and located workshops on the site to make work easier for the craftsmen. Today, the building of the church follows Gaudí’s original idea and, just as he himself did, the best techniques are applied to make the building work safer, more comfortable and faster. It is some time now since the old wagons gave way to powerful cranes, the old manual tools have been replaced by precise electric machines and the materials have been improved to ensure excellent quality in the building process and the final result. Antoni Gaudí was run over and killed by a Barcelona tram in June 1926 but by that time, he had been working on his design for the Expiatory Church of the Holy Family for 43 years — almost his entire architectural career. 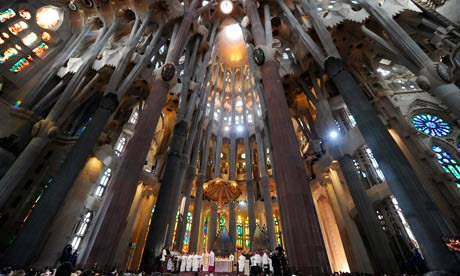 For the last twelve of those years he worked on the Sagrada Familia to the exclusion of everything else, and during his last eighteen months he slept on site in his workshop in the church’s crypt, where he soon would be buried. But work was always slow because money was extremely tight, and at the time of his death only a fragment of the church had actually been built: the apse and melting candle wax Nativity façade with its peculiar spires that was to become the instantly recognizable symbol of the city of Barcelona. After Gaudí’s death, his inner circle of collaborators continued to work slowly in the violent days leading up to the outbreak of the Spanish Civil War, when a rampaging anarchist mob broke into the workshop and destroyed Gaudí’s remaining drawings and plaster models. Today the present Church Technical Office and the management are charged with studying the complexity of Gaudí’s original project, performing the calculations and the building plans and directing the works as a whole. 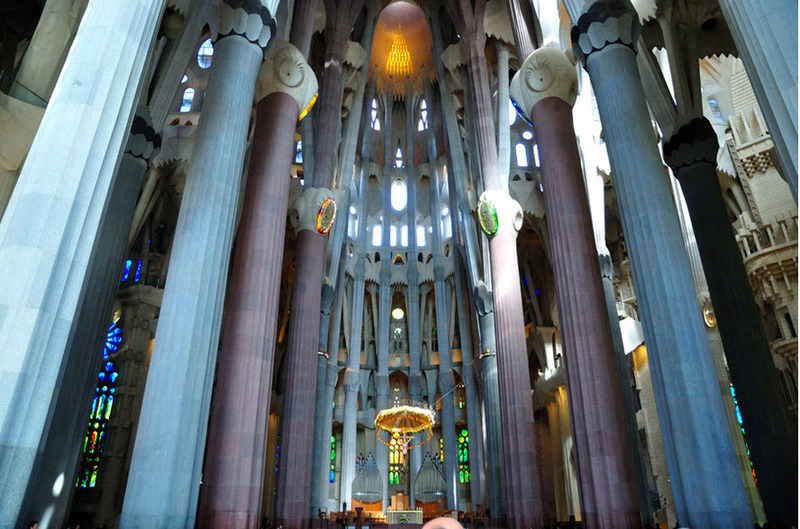 According to the latest estimates, the Sagrada Familia will be completed by 2026, the centenary of Gaudí’s death. Over the next few years 10 more spires, the tallest reaching 170 meters in height, will dramatically transform the building’s roofline. We will explore very briefly the exterior and interior of the structure hoping to indicate the complexities of design and fabrication. You will certainly understand why completion is still years to come. As you can see, the church is meant to be a “neighborhood” church and is definitely accessible to the public at large. Even though the digital above does not give the overall footprint justice, it does show how the structure is positioned relative to surrounding buildings and streets. The JPEG below will show the main structure when completed. You must agree, it is a daunting undertaking. Given below is the structure as competed to date. The following slides will indicate to you the craftsmanship of the exterior and how truly detailed the designs are. I have no idea as to how long each took, but it must have been painstaking. The interior of the church is no less marvelous than the exterior and just as intricate. The vaulted ceilings are truly individual works of art as can be seen from the following slides. I hope at some point in your life you visit Barcelona and Sagrada Familia. You will come away knowing, as I did, Gaudi was an absolute genius. Time to him was not a factor in design or construction. He knew he would not live to see the church’s completion but felt sure those craftsmen following him would bring about its completion. As always, I welcome you comments. 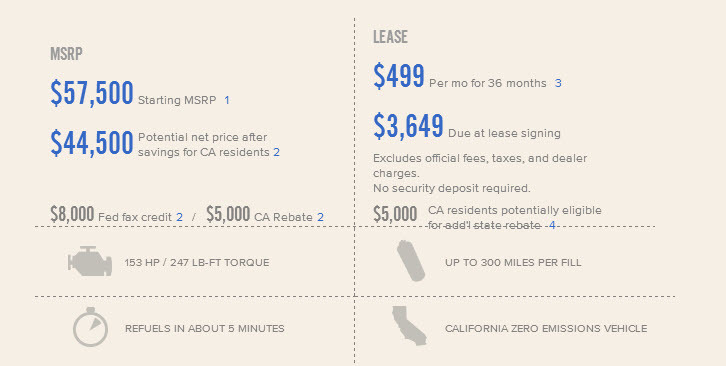 Automakers have taken many approaches to lessen the cost of travel relative to miles per gallon. While running my Saturday errands, I noticed gas prices for “low lead” octane to be $2.34 and $2.39 per gallon. Further investigation indicates the following for 7 December 2014: “Today’s national average price of gas is $2.75 per gallon, which is the lowest average since Oct. 5, 2010. Gas prices nationally are about 52 cents per gallon less expensive than a year ago, which is the greatest year-over-year savings since 2009.” In my opinion, these lower prices are not sustainable and will increase over the 2015 year. Removable of oil from tar sands and fracking certainly contribute to lower prices but oil is a non-renewable resource and prices will not remain artificially low for years to come. Another factor– global instability. Does anyone really know what might happen in the Middle East? What events could possibly effect production in that region and for how long? 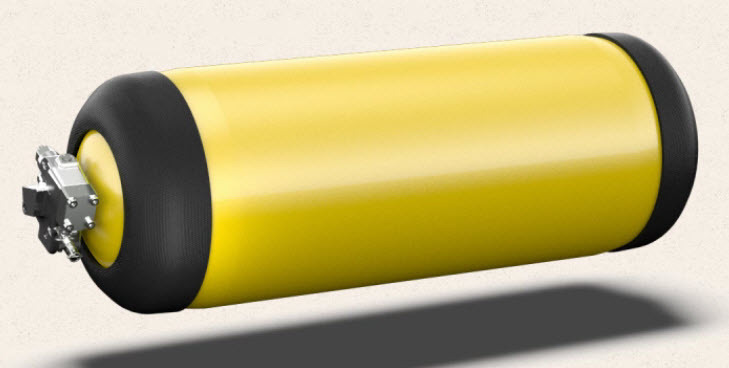 Electric vehicles using lithium-ion batteries. The Nissan Leaf, Honda Civic Hybrid, Chevy Volt, Toyota Prius and Ford Escape represent offerings using this technology. Vehicles using CNG or compressed natural gas. Natural gas powers about 112,000 vehicles in the United States and roughly 14.8 million vehicles worldwide. Natural gas vehicles (NGVs), which can run on compressed natural gas (CNG), are good choices for high-mileage, centrally-fueled fleets that operate within a limited area. For vehicles needing to travel long distances, liquefied natural gas (LNG) is a good choice. The advantages of natural gas as a transportation fuel include its domestic availability, widespread distribution infrastructure, low cost, and inherently clean-burning qualities. By my count, there are nearly 100 conventional hybrid, plug-in hybrid, battery-electric and diesel vehicles already in production, although some are built only for limited markets, primarily some or all of the states that have adopted California’s zero emissions vehicle mandate, which are known as the ZEV states. Most of these cars have been introduced in the past five years, and things have slowed a bit after that flurry of activity. Automakers are still trying to figure out which technologies and fuels have the most promise in the race to slash oil consumption and greenhouse gases. I’m saying the obvious but if it does not look good it will not sell regardless of the MPG and cost savings realized. The Mirai really looks good. Toyota products have styling that is attractive to the American market. 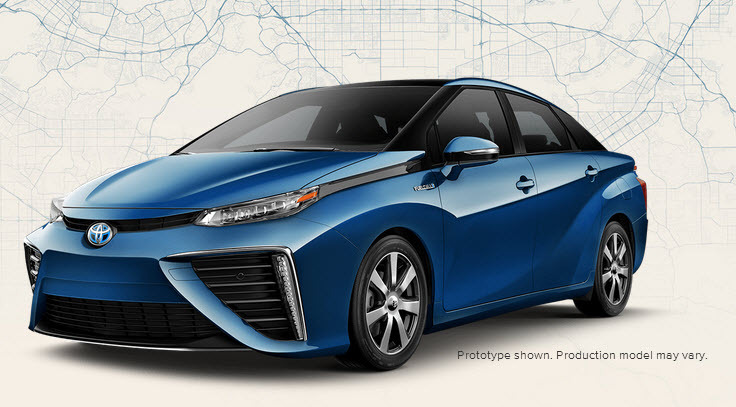 The Mirai incorporates all of the refinements customers desire in a “street-worthy” vehicle. 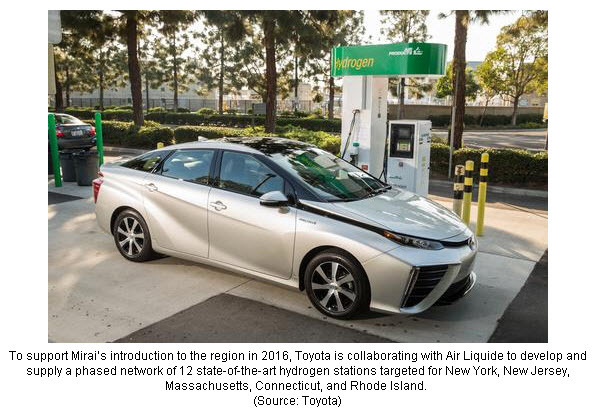 You will please note that Toyota is working with Air Liquide to supply limited infrastructure to twelve (12) states so refueling is possible. They recognize the fact that this is critical to success. As you can see, very compact-large but compact. 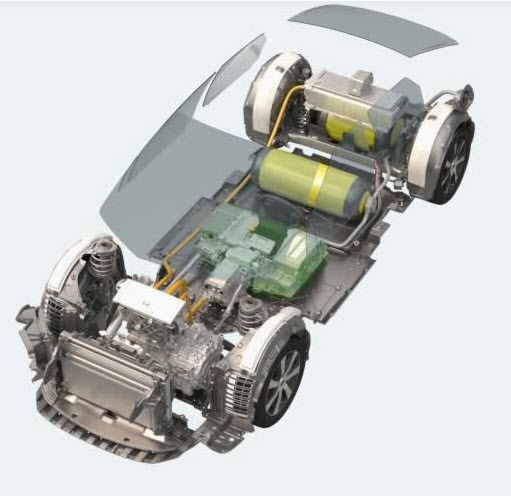 The various components are positioned in a fashion as given below with the fuel cell resting comfortably under the rear passenger seats. As can be seen below, under the hood is clean, functional and fairly easy to address when maintenance is needed. There are 370 stacked cells powering an AC synchronous motor that can deliver zero to sixty miles per hour in nine point 1 seconds. Not bad and certainly enough to pass a fast-moving eighteen-wheeler. The Mirai weighs 4,078 pounds also which gives enough mass for driver and passengers to feel protected during interstate driving. The first pilot run will produce seven hundred (700) vehicles for selected road testing. Toyota indicates they have run millions of test miles during all types of weather and weather conditions with favorable results. These vehicles will meet and or exceed all Federal requirements when fully commercialized. The planning phase indicated full availability some time during the 2016 year. It is obvious from the start that $57K is a huge entry price and many potential buyers will be unable to pay this price. No doubt that Federal and possibly state rebates will be needed to underwrite this expense and only time will tell if those might be available. On other factor, the infrastructure to support refueling will definitely be needed is moderate success is possible. 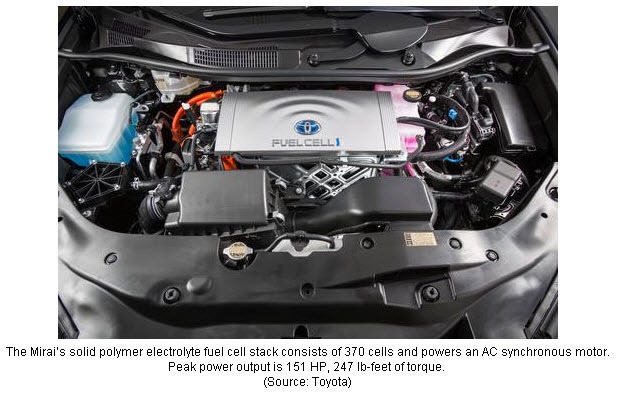 These two factors represent two problems Toyota faces, but they recognize the barriers and seem willing to “bite the bullet” and certainly hope for the very best.